In the Coen Brother’s movie “A Serious Man,” we see young Danny practicing his haftorah for his bar mitzvah by listening to the cantor’s rendition of it on his record player. That scene was undoubtedly sentimental for Jewish men of a certain age who prepared for their bar mitzvah by keying up the phonograph in their parents’ living room. Bar Mitzvah preparation has come a long way since the days of the record album. In the 1980s and early 1990s cantors and bar/bat mitzvah tutors recorded their voices onto audio cassette tapes so their twelve-year-old students could walk around the house listening to the chanting on a Sony Walkman. 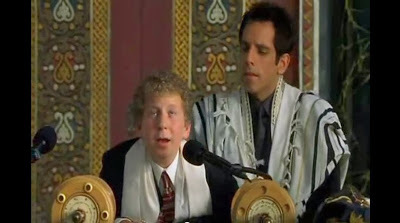 In fact, I remember many nights falling asleep with my black foamy headphones on while I listened to the late Cantor Larry Vieder of Adat Shalom Synagogue repeating the Torah trope (cantilation notes) and the long haftorah for my bar mitzvah. The mid-1990s saw the transition from the audio tapes to music CDs when bar mitzvah tutors began hooking up microphones to the computer and recording the bar mitzvah portion onto blank CD-Roms. In recent years we’ve seen bar and bat mitzvah students receiving the audio version of the haftorah and blessings they need to learn via email, a concept that anyone over the age of thirty would find amazing. The way Jewish teens prepare for their bar or bat mitzvah has changed dramatically thanks to technological innovation. Not only has the audio format changed over the years, but so too has the way in which these young men and women are being tutored. I was recently at a retreat for Jewish leaders where I met Todd Shotz. Todd launched Hebrew Helpers several years ago as a way to provide in-home, one-on-one personalized bar and bat mitzvah instruction. In addition to coordinating private bar/bat mitzvah services for families that do not belong to a congregation, Todd’s company arranges for tutors to work with children to prepare for their b’nai mitzvah. While many of his students are matched with local tutors in the Los Angeles area he has also found that he can help Jewish teens around the country through Skype and other video conferencing applications. Shotz isn’t the only one taking advantage of this new technology to help students prepare for their bar or bat mitzvahs. Even local tutors who frequently meet with their students in person are using Skype, Apple’s Facetime or Google’s hangouts to conduct reviews with their students before the big day. Today’s teens have such busy schedules that it’s not always feasible for them to meet with a tutor at the synagogue so late night sessions over the internet are more conducive. There are also a couple of mobile apps that have changed the way tech-savvy Jewish twelve-year-olds train for their bar or bat mitzvah. Rusty Brick’s Tikun Korim lets teens use their iPhone, iPad who Android device to learn to read their bar or bat mitzvah portion. The mobile app is an interactive text of the Torah and haftorah with the appropriate musical notes. The layout of the Tikun is specialized designed to fit the iPad or iPhone (an Android version was released a few months ago) and is about half the height of a normal Tikun (the book used for aiding in Torah reading). The app works in both landscape and portrait mode. While in landscape (horizontal) mode, it shows the Torah view on the left and the ta’amim (cantorial notes) on the right, and portrait (vertical) mode shows only one view at a time with a quick toggle switch to flip between the two. A nice feature of Tikun Korim is the bookmark feature for quick access to the specific Torah portion the bar mitzvah boy or bat mitzvah girl is studying, as well as the capability to record and email a recording to the tutor. What is very helpful with this app is that it includes chart of the cantilation notes with each note’s sound provided by a professional bar mitzvah teacher so that the student can learn to chant the Torah reading on his own. The app even has Megillat Esther for Purim in addition to the entire Torah and Haftorah readings. There are both Ashkenazi and Sephardi versions of all the chantings. Tikun Korim sells for $19.99 in the iTunes store and in Google Play. TropeTrainer has nice navigation features, such as the ability to jump directly to any aliyah or chapter, and the font is very easy to read. Both TropeTrainer and Tikun Korim allow the user to view the Torah readings in the font found in actual Torah scrolls. TropeTrainer additionally has side-by-side English translations, which highlight the translation to follow the Hebrew text. Students are also able to adjust the chanting speed, pitch, accent, and vocal range so they won’t struggle to try and match a pre-recorded voice. There are also more than thirty Torah chanting melodies including several selections for the special High Holidays melodies, plus two dozen Haftorah melodies. There is also the option to turn on colored highlighting of phrases from the three most common trope groups. Finally, TropeTrainer has a built-in calendar to take the complexity out of finding the appropriate reading for that Shabbat or holiday. 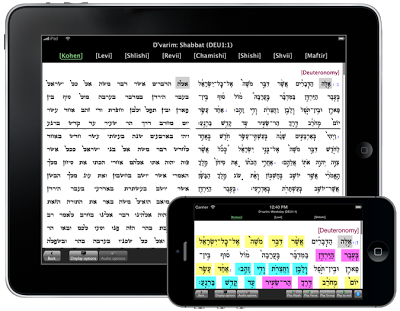 Both apps support both the annual and triennial cycle Torah readings. Bar and bat mitzvah training has no doubt advanced as technology has advanced. While I’ll always remember the hours spent each day back in 1989 with my Walkman and the cassette tape of my haftorah, my children will likely be practicing for their bar mitzvah on their wristwatch synced with their Samsung Galaxy Note or looking directly into the Torah scroll while their Google Glass provides the trope marks. Now that’s what I call tradition and change.